Home > Free > Free Bag of Ruffles! 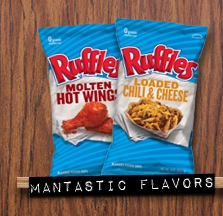 Ruffles is offering a coupon for a free bag of their new “Manatastic” snack size chips. This comes through regular mail but you need to request it online. 1. Like Ruffles on Facebook. 2. Allow access to the “Get Bagged” application. 3. Enter your mailing address for your coupon. Note: Their facebook page is running very slow, so keep trying if you want it.